The British Columbia-based Seaspan Group has three shipyards on Canada’s West Coast active in the shiprepair and refurbishment market, and all are performing well, despite difficult market conditions generally. Turnover at the yard was up appreciably compared with 2015, and its two floating docks enjoyed an occupancy rate in excess of 90%.”We were effectively full for most of the year,” Hebson points out. “Prospects for 2017 look good as well. The yard is already booked through to the end of May and we see a lot of opportunities, especially in the passenger shipping sector, for the rest of the year." 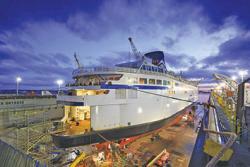 One notable docking that has been confirmed for VDC is Oceania Cruises’ Regatta. The cruise liner is booked in for May this year when it will be docked for maintenance and repairs. Seaspan has invested heavily in recent times to upgrade the Vancouver Drydock facilities, including new CNC cutting equipment, a new turntable and new more environmentally friendly blasting systems. “The past year has seen us take a big step forward in terms of our productivity and environmental stewardship as a result of these investments,” says Hebson. With the redelivery in April 2016 of the HMCS Regina the yard completed the fifth of five major upgrade projects involving Canadian Navy frigates. Each project lasted 12 months and the Canadian Navy expressed great satisfaction with the outcome. In the first half of the year Victoria Shipyard also handled two significant cruise ship dockings, with the arrival of Celebrity Millennium and Crystal Symphony. Then, unusually, Victoria Shipyard had a slow second half of the year, largely due to the fact that the Federal Government undertook a major life extension programme to the state-owned drydock, with the result that it was out of service for five months between June and November 2016. This inevitably affected the volume of work carried out by Victoria Shipyard over the whole of the year. A New Zealand frigate is due to dock later this year for a similar package of work to the Canadian Navy frigates, and the HMCS Calgary is expected to arrive for a large programme of work in June. One Princess Cruises ship has been booked in for December, and will be followed by three cruise ship dockings in 2018 and another in 2019. Following on from the drydock refurbishment work, extensive repairs are now being carried out to one of the jetties at the shipyard, and this should be completed in 2019. Electrical upgrades are also underway, and due to finish in 2018. Among other benefits this should allow the yard to ‘cold iron’ cruise ships while they are in dock.